Zachary Elwood ("Exploiting Poker Tells") examines behavior in huge $1M Big One for One Drop hand. 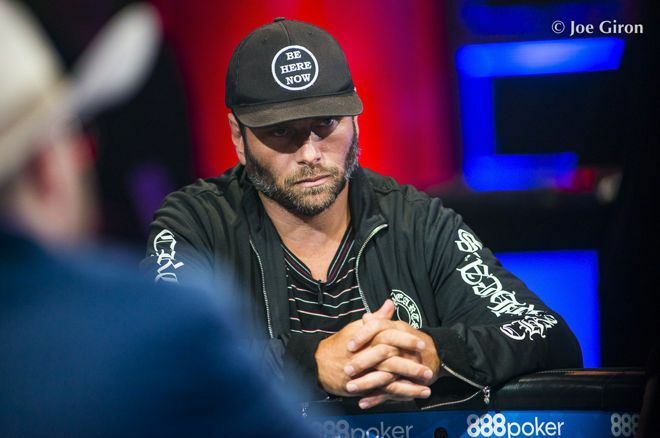 Analyzing Rick Salomon's behavior while Fedor Holz contemplates call in decisive One Drop hand. They were five-handed, with the blinds 300,000/600,000 and a 600,000 big blind ante. Dealt under the gun, Byron Kaverman shoves all in for just over 8 million (a little more than 13 big blinds). 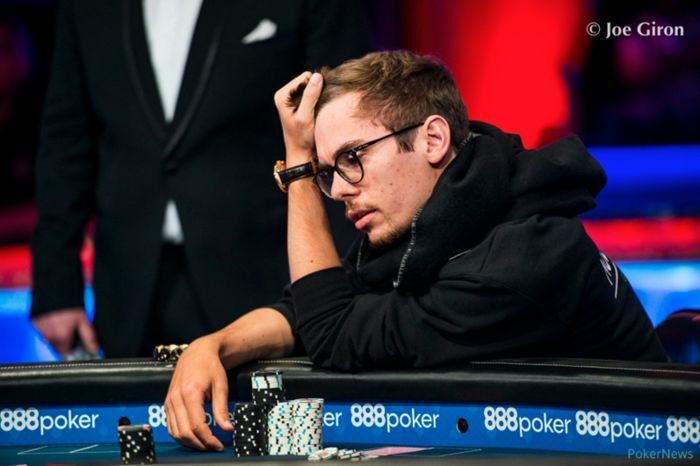 Fedor Holz was next to act and calls with , leaving himself a little more than 19M behind. The button and small blind both folded, then Rick Salomon very quickly shoves from the big blind with . Salomon and Holz had nearly even stacks to begin the hand, with Holz barely having Salomon covered. Interestingly, before shoving, Salomon exposes a card — the — and Holz gets to see that. A few interesting behavioral things happened in this hand. Keep in mind that in the discussion below I am referring to general patterns. I haven't had a chance to watch any other footage from this event, and these patterns would be less reliable if Salomon was often prone to unusual or unexpected behavior. When the full event becomes available, I plan on watching more of the footage leading up to this hand. Let's look at those behaviors. A very fast shove here, in such a significant spot, will be weighted to AK. Even without the behavior, we can assume Salomon's range for shoving here, after a shove followed by a call from another big stack, is quite narrow, probably somewhere around JJ+ and AK. With AA or KK, it's the rare player who wouldn't pause for a few moments of fake thought in this spot, even if they know they're always shoving. And most players would at least consider just calling with AA, even if those players are almost certainly shoving. With QQ or JJ, there is obviously some motivation for actual thought. At the very least, most players would want to think for a bit about whether Holz might have just called with AA or KK. For these reasons, in such a spot where a range is quite narrow, a quick shove will be highly weighted to AK. Salomon moves around a lot both before and after he shoves. He also stacks up chips aggressively, and makes a shrugging gesture as he shoves. He additionally touches his face several times and moves his chips into the pot with quick motions. If you've read or watched much of my content, you might already know I say that in early-hand/preflop spots like this, players with AA or KK are generally more thoughtful and mentally focused. They will be thinking hard about the best course of action, and they also have an instinct to not draw attention to themselves or scare away an opponent. All of these forces lead to players with the strongest hands early in a hand to be more stoic and still (at least for a little while). So I think Salomon's agitated behavior here weakens his range. When Salomon shoves, he has a small palms-up gesture. I don't assign a lot of meaning to this behavior early in a hand, especially preflop, as hand strengths are so undefined. Shrugging basically communicates "I don't care," and this is something we can easily imagine players with both strong and weak hands can have a motivation to communicate. Players with weaker hands may want to communicate "What's it matter if I shove? I've got a strong hand." Players with strong hands may want to communicate: "This spot doesn't matter to me. I might have a weak hand because I don't care." Here, this is an example of the behavior being done with a weaker side of a range. For an example of someone doing similar shrugging motions with AA, watch this memorable hand from an earlier WSOP featuring Beth Shak. I will say that I do think that for more experienced players such as Salomon, this behavior will weaken a range, mainly for the reasons mentioned above about being more stoic and still with AA and KK. A minor thing, for sure, but I've found that players who put all or most of their chips forward when shoving or making a very large bet are a bit more likely to be on the weaker side. And not putting chips in when making big bets or shoves makes strong hands a bit more likely. One reason for this tendency is the fact that players with weak hands have an incentive to express confidence and certainty, and placing chips in the pot is one way to seem forceful and confident. Also, just saying "all in" and not putting chips out for easier display for counting can come across as slightly challenging or rude, and challenging or rude behavior is more likely associated with strength and relaxation. Also, players with weaker hands want to make sure their bets are seen and understood. They don't want to put out a single stack and have someone behind them think they only called. For all of these reasons, putting out chips like this will tend to weaken a range. But again, this is a pretty weakly reliable pattern. It was pretty strange how Salomon held his cards up high when looking at his hand, like some sort of beginner-level player, while seemingly accidentally allowing one to be exposed. It's my guess that Salomon had already looked at his cards, and for whatever reason, was just acting like he had only just then looked. Someone told me (and I haven't seen other footage from this event so can't confirm) that Salomon was seemingly playing a little crazy leading up to this hand, so maybe this was all part of an ongoing pattern of strange behavior. I do not think he exposed the ace purposefully, as some people seemed to think was possible, because that actually helps Holz. As Holz says in the hand, "That makes it better." It narrows Salomon's range to either basically AA or AK, and just mathematically there are more combos of AK than of AA. Holz recognized this, but I also believe one reason he thought so long and hard here before calling was because he probably thought (correctly, I think) that Salomon's shove (especially with it being so quick) was likely to represent either AA or AK-suited (and not AK-offsuit), in which case there'd be three combos of AA and three combos of AKs. As shown above, Holz did ultimately call, and after a dramatic runout scored a double-knockout of both Salomon and Kaverman. Holz would go on to finish runner-up to winner Justin Bonomo. I do want to watch this event, which I understand will become available on PokerGO in a few weeks. So if I watch some of that footage and have more thoughts, I'll probably be adding it to my blog. Zachary Elwood is the author of Reading Poker Tells, Verbal Poker Tells, and Exploiting Poker Tells, and also has a video series at www.readingpokertells.video. You can find him on Twitter at @apokerplayer.